Film and camera, oh my! Before I start talking about precise equipment with bells and whistles, I'd like to talk a little bit about the greatest film ever created: Kodachrome is the film of the gods. I've never been to heaven, but I bet that the landscape is rendered in the bright, super saturated colors that I associate with Kodachrome. There would be deep, deep blue skies, hot reds, and bright yellow colors. 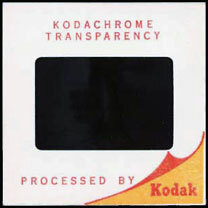 Kodachrome was the first color reversal film (during processing, Kodachrome is a negative file, but when film is chemically re-exposed to light, it is converted in into a positive image). It was introduced in 1935 with a film speed of 10 ASA for the daylight version, 16 for the tungsten version. This means that it was not very sensitive to light and required a tripod a lot of the time. The famous photographer, Ernst Haas, used slow shutter speeds to make use of this film and discovered that the blur that resulted brought out some of Kodachrome's finer qualities. He also bought a refrigerator full of the original Kodachrome when Kodak introduced Kodachrome II (ASA up to 25!) in 1961. Kodachrome was basically a fine-grained black and white film that had color dyes added during processing. Other transparency and color negative films have the dyes built into the film, and the development process is used to process each of the color layers. Agfachrome, Ektachrome, and Fujichrome used this process to produce colors. Kodachrome was different - and boy, what a difference! Now, of course, we live in digital photo land, which brings me to the second part of today's column - I'm in love with a (so far) unattainable object. 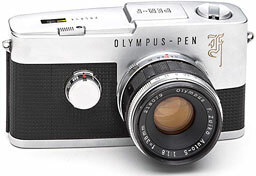 Olympus Corporation has been producing fine quality cameras since the Pen F (1963). 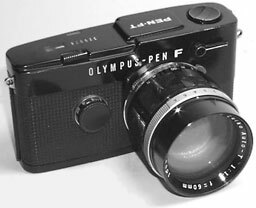 The Pen F was a half-frame camera - that is, it took pictures that were half the size of a normal 35mm camera (18 x 24mm instead of 24 x 36mm). Instead of 36 slides in a roll of Kodachrome, you could take 72 slides. It was a boon for tourists and photographers who wanted to test out a new emulsion. I owned a Pen FT at one point, but I sold it with a Rolleiflex to raise some cash. 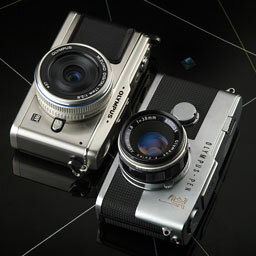 Olympus went on to invent a full frame camera - the immortal Olympus OM-1. I own one of these beauties, although the film release button doesn't work. The OM-1 is purely mechanical; the only thing in the camera that needs a battery is the light meter. It is sort of a photo hockey puck, in that it is so rugged. I also own one of the last cameras in the OM series, the multi-spot metering OM-4. IMHO, the OM-4 has the most sophisticated light measurement system in a 35mm camera - but they use film, and we live in the digital age. However, Olympus has done it again. Sure, Olympus makes some very fine digital DSLRs, but now it has introduced the E-P1, a camera that has interchangeable lenses and no optical viewfinder. Many are calling it the "Digital Pen" due to its similarity to the Pen F (see photo, right). It is a small digital (12.3 megapixel) camera that not only uses it's own family of Four Thirds lenses, but (I mean but) it can use my old OM series lenses with an adapter. * My lenses won't autofocus and will have to use stop-down metering, put I can still use them. No one likes to keep using old technology like me. Funding will determine when I get my hands on one, but it will be the end of an era. I will finally have a high quality digital camera to use for serious photography. Tools change, but the vision remains.